Sjon is an icelandic writer his full name is Sigurjon Birgir Sigurosson ,he started as a poet in the late 1970’s ,during 80’s he work closely with the icelandic band Sugarcubes in their early days and is himself involved in the local music scene and has worked with Bjork since she left the sugarcubes on a number of projects .He has written seven novels this was his latest novel ,I first notice him a couple of years ago when some fellow bloggers reviewed his novel The blue fox .At moment these are his only two books to be translated in to english lets hope more get done . Jonas drew diagrams from worm showing how the fish lay in the sea ,wielding its tusk like a lance ,and a comparison of these with the royal specimen convinced worm that it was a Narwhal skull with a tusk and nothing more .And so that day in the museum wormianum the Unicorn’s fate was sealed :a year after his meeting with Jonas Palmason .Ole Worm published a epoch-making article on the similarity between Narwhal tusks and Unicorn horns . 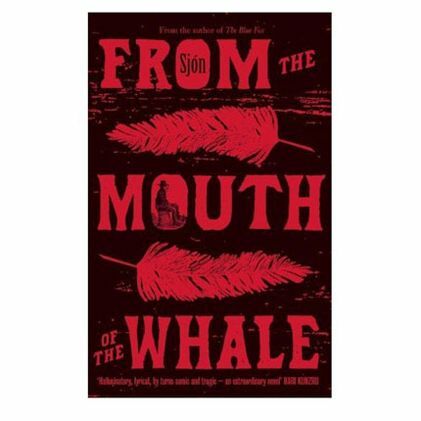 So His latest book to be translated into english is From the mouth of the whale it is set in 1635 ,maybe just before the age of enlightenment but this is part of this books story the change from myths and legends to real science is facing the world and maybe via this simple guy .At the centre of the novel is the life of Jonas Palmason ,Jonas is a daydreams ,a bit of vagrant and has had really bad luck.He seen at the start eating weird things like ravens head .Nature is a recurring theme in this book from the title to Jonas only friend a purple sandpiper .He spends time with Ole worm a scientist of sorts He does this while in exile .I feel what we see is the progression of Jonas He starts of as a man stuck in tradition of magic and myths of Iceland ,he learnt via dead creatures how bodies worked and became a sort of healer using nature ,then in the middle section we see him connecting with science ,like a description of a unicorn horn that isn’t but a narwhal horn having seen one years ago in a museum I remember reading there was a roaring trade in deceiving people it was a real unicorn horn,he shows how Ole worm worked out it would need to be a surreal horse of gigantic size that could wear such a horn on its head . Then in the end examing the world anew seeing all the wonderful creatures .We also see the woes of some Basque whalers that have arrived to whale the icelandic waters . I like this book even more now you’ve linked it to Noggin The Nog! Fantastic video! this was my favourite & that never changed, others got close, but this held on. Spot on, Stu, and I love the pictures! I have The Blue Fox at home but unread presently, and this on my radar. Nice review Stu, I like how you bring out the retention of a lyrical quality to it. The few sagas I’ve read were marvellous. I should read more of them, but then I should read more of so many things. I’m enjoying the Noggin the Nog link, too. My Dad used to read them to me when I was little. Stu, have you read The Pets by Bragi Olafsson? He also has a Sugarcubes connection. Obviously a very literary band, although as far as I am aware Bjork hasn’t written a novel… yet. Stu, if you do try a saga I’d suggest starting with The Story of Burnt Njal (has a few different titltes but googling Njal should find it) or Egil’s Saga, both of which are pretty good. Njal is exceptional.